THE CLIMATE WARS: CAN THE EULIPOTYPHICENE SURVIVE THE ANTHROPOCENE? CAN THE EULIPOTYPHICENE SURVIVE THE ANTHROPOCENE? HEDGEHOGS, HERMIT CRABS & CHINCHILLAS LIVING TOGETHER ? A long-running and emotional biodiversity debate came to an end today as Virginia voted to strike down a ban on pet hedgehogs, and ease permitting for hermit crabs and chinchillas. 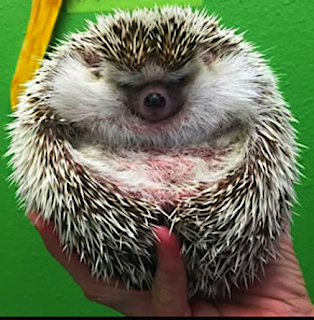 "That is the perfect recipe for people to think it would be fun to own one," said Christina Anderson, Fairfax County Animal Services Advisory Commission member who testified for sustaining the hedgehog ban. "Nothing could be further from the truth." State prohibitions on owning stoats, bats, ants, & Quaker parrots will remain in force.